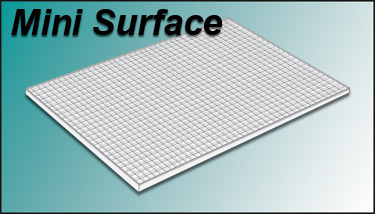 The Morton Glass Cutting Surface is the heart of the Morton System. Since 1980, the cutting surface has been the smart way to work with glass. Glass chips fall below the cutting surface, leaving your surface and surrounding area clean without sweeping. The square cells are used to position the fixtures of the Portable Glass Shop. The new Mini Surface Plus is two sections that link securely together. If you want to create a larger cutting surface, purchase two sets to equal 22.5" x 31.5"
Click the button below to add the MORTON MINI SURFACE PLUS (22.5" x 15.75") to your wish list.